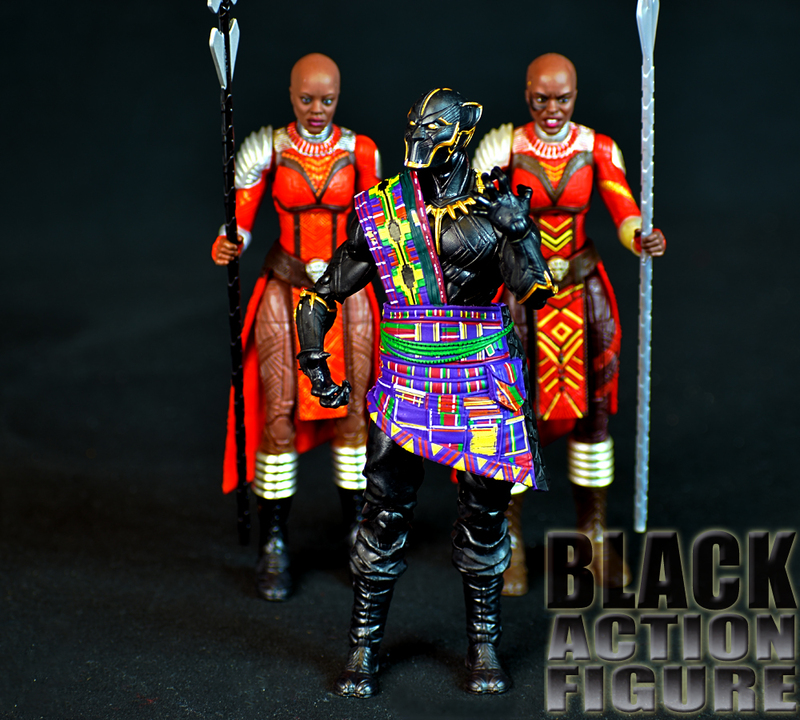 Coming back at you with a review of T’Chaka from the Marvel Legends Black Panther series Wave 2. At this point I really want to finish up these last three figures soon so I can hurry and get to review the M’Baku Build-A-Figure. 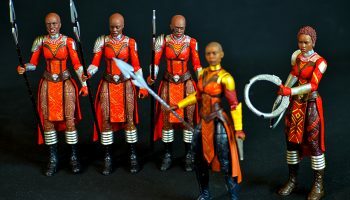 That leaves another Black Panther figure and the Dora Milaje left to review before that. The packaging stays consistently the same in this wave. So we’re on the edge of the “wysiwyg” trend…”What You See is What You Get.” You don’t see any accessories? There’s a good reason for that…it’s because you don’t get any accessories. 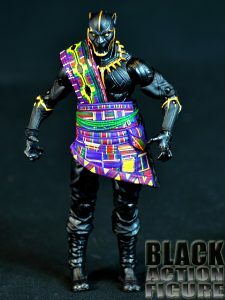 Okay, loosely speaking, I guess you can really say that the multi-colored ceremonial Wakandan garb is an accessory. While it is removable with some effort, there really isn’t any reason to remove it. 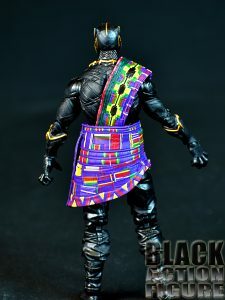 As an accessory, the Wakandan wrap is actually really nice. 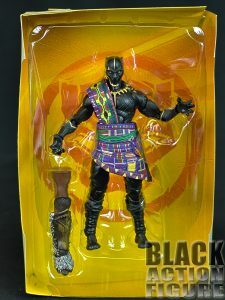 As far as I can tell it is accurate in it’s colors and design and makes the figure unique. My issue with it? Why isn’t it soft goods? I know some of us are divided between soft goods and plastic clothing, but I would have loved to see Hasbro try this out as a piece of fabric instead like they do with their Star Wars Black figures. It would have sat on the figure better if done correctly. 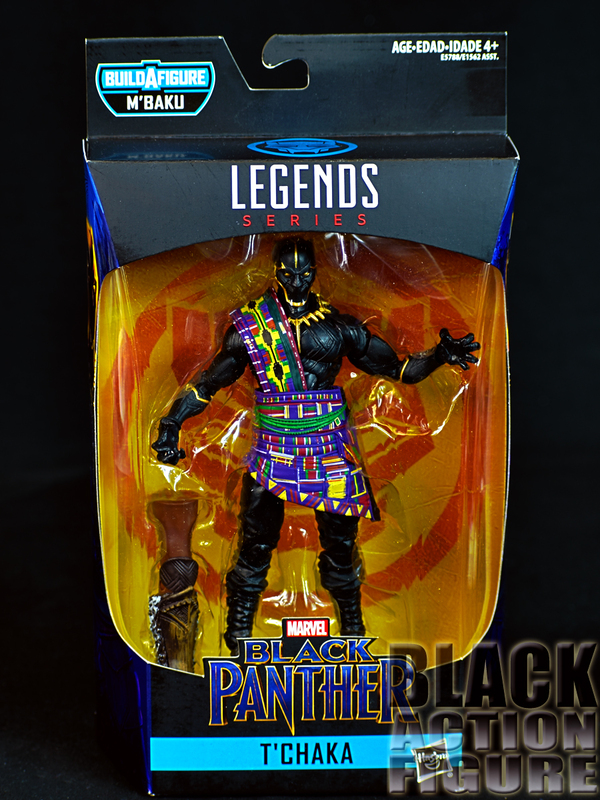 I guess it’s hard to make accessories for someone who was in the movie for 5 minutes. The very least they could have done was provide us with a movie-accurate unmasked head sculpt. 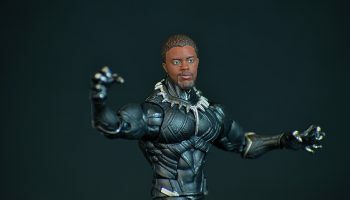 Technically the sculpting is good, using a new head sculpt on top of a repainted Black Panther body (see the last Black Panther review) with some different legs. 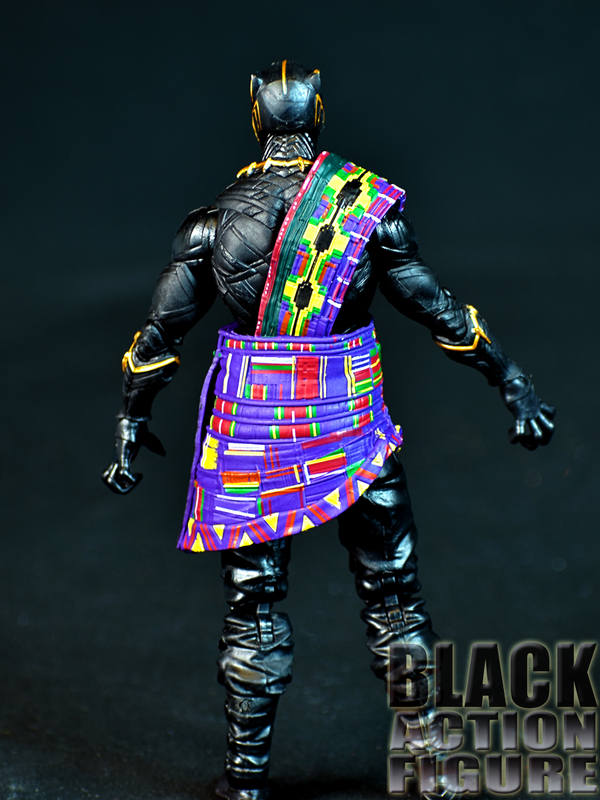 The paint application is excellent on both the figure body itself and the Wakandan tunic wrap. Again, the “plastic-ness” of the wrap causes the likeness to be completely thrown off. It is actually so bulky that it makes the figure look short and stumpy. In hand, the figure actually looks a lot better than posed in the pictures. 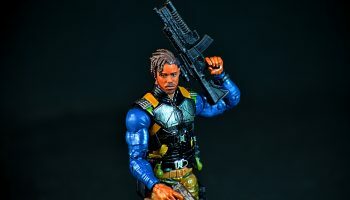 That could very well be that when standing, you have to find the right pose to support not only the figure but this big, bulky piece of plastic as well, completely throwing off the look. Still impressed with the 32+ points of articulation, although this time some of it is understandbly hampered by the big, plastic frock draped across the figure. 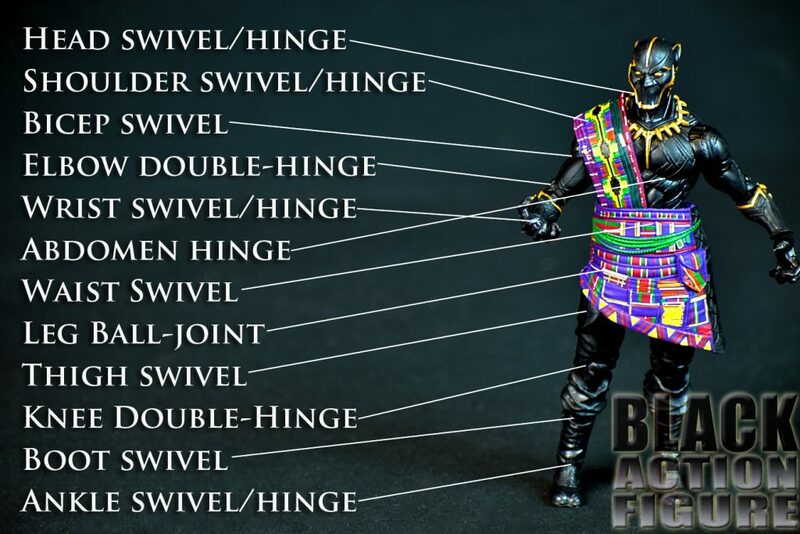 And it also throws off the balance of the figure, making it harder to pose than other Marvel Legends figures. Honestly, this figure is obligatory anyway. 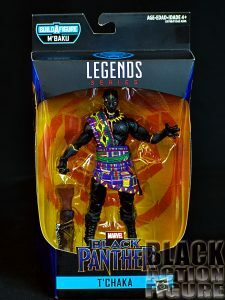 Most people will just buy it so that they can get the right leg of the M’Baku Build-A-Figure. 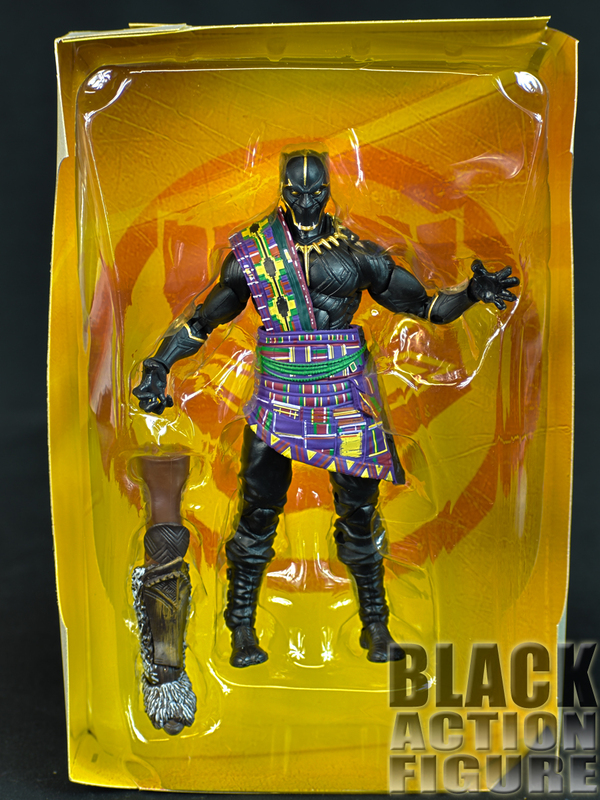 It will stand in my Black Panther collection, but honestly it won’t be doing much anyway. You know, like he did in the movie. I didn’t really expect much from this figure. 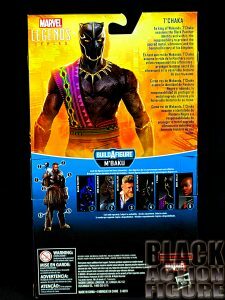 And to be honest, I don’t really expect much from the Hot Toys figure either. I mean, how can you expect much from a character who was in the movie for less than five minutes? 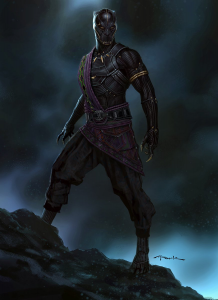 And was in the full Black Panther suit (including helmet) for roughly only 20 seconds? Thank you Marvel for bringing such diversity and characters in your line, even though you make us wait for major storyline characters like Shuri. 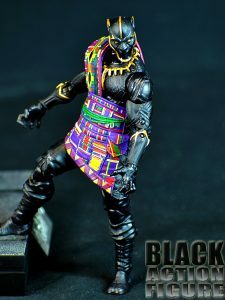 Anyway, rounding the corner with my M’Baku figure review.